Loneliness is something I’ve struggled with for…majority of my life. I think to an extent everyone feels lonely from time to time, but the intensity differs. Mine can get, uhh, bad. Since I was in third grade, my friends have either moved away, decided to not be my friend anymore, developed romantic feelings for me that they couldn’t separate from our friendship, stopped hanging out with me when I stopped playing shows (I used to organize music shows and play them too), didn’t want to deal with my mind obstacles anymore, or I had put too much on them to take care of me. A therapist at the Los Angeles LGBT Center’s Audre Lorde Health Program, Women’s Primary Care in West Hollywood explained that these consistent and repetitive events created a developmental trauma, and that is why the feeling of loneliness and loss for me can be unbearable. My fear of saying the phrase “best friend” out loud is synonymous to the intense fear Hogwarts wizards and witches have of saying “Voldemort” – except that instead of fearing that Voldemort will appear, I fear that my best friend will disappear. Anybody that called me their “best friend” I knew had signed our friendship death warrant. 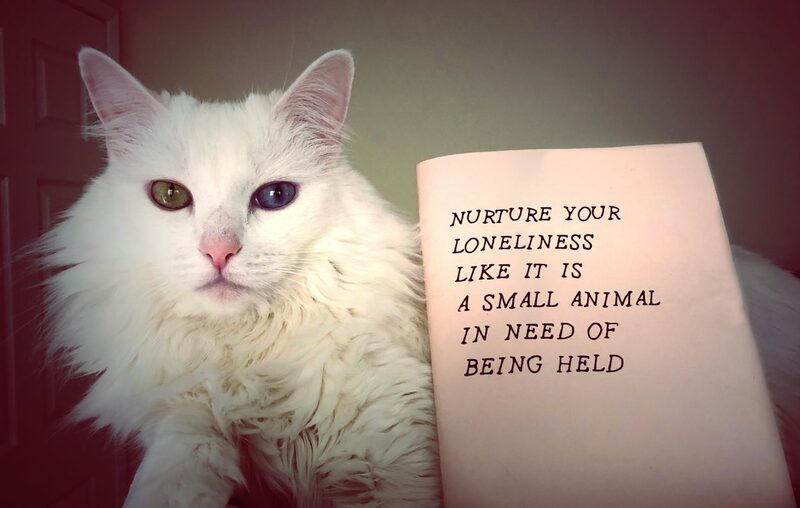 In 2019, I’ve already needed Lora Mathis’s zine “Nurture Your Loneliness Like it is a Small Animal in Need of Being Held” twice (yes I realize it’s only the beginning of April lol). I remember seeing it at San Francisco Zine Fest and thinking, “wow, this will probably be extremely useful for my next breakdown,” but I had no idea just how much this zine would protect me from myself, and embrace me when I needed support from anyone…or in this case, anything. 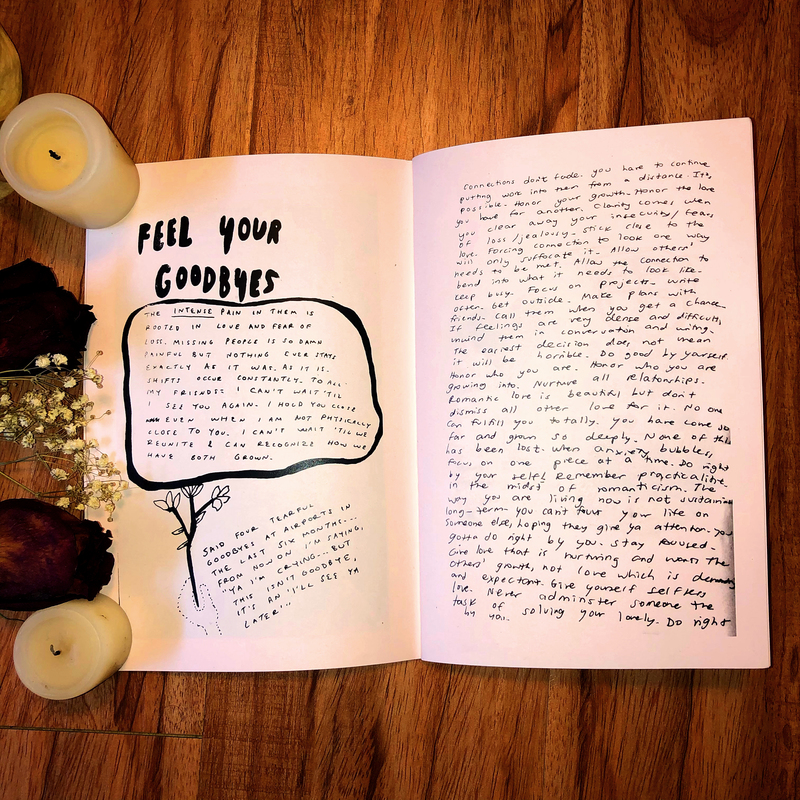 Mathis’s zine feels like it has arms that hold you as you sob, and wipe away your tears with each page. 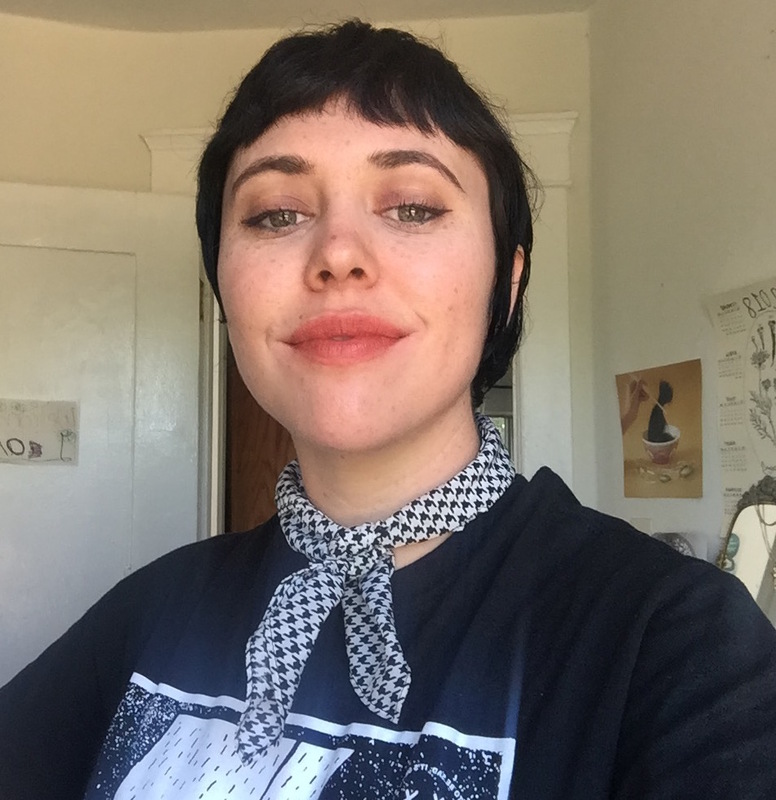 Lora Mathis (they/them) is a visual artist and poet currently residing in San Diego, who uses art and writing to unlearn and heal from social myths of oppressive systems. 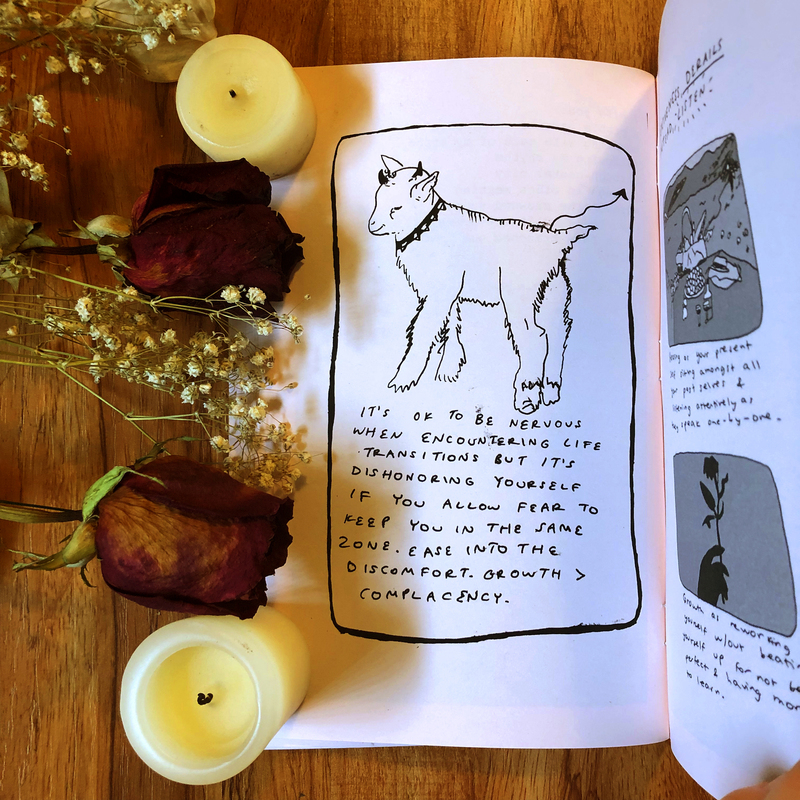 According to Mathis, this zine in particular is, “A look into my journal, with comics, writing, and photos dealing largely with transition, self-growth, and sitting with loneliness.” They detail their experiences with long-distance friends, grief from a friend experiencing physical trauma, and heartbreak. On the contrary, they also express their immense love for their friends, acceptance of the difficulties of change and growth, and gratitude for self and the present environment. It truly does feel like a personal copy of Mathis’ journal – 44 half-pages printed on light pink paper with black and white images and black text that is mostly handwritten. Some of the words are smudged or scribbled out, giving it a natural, unedited feeling. 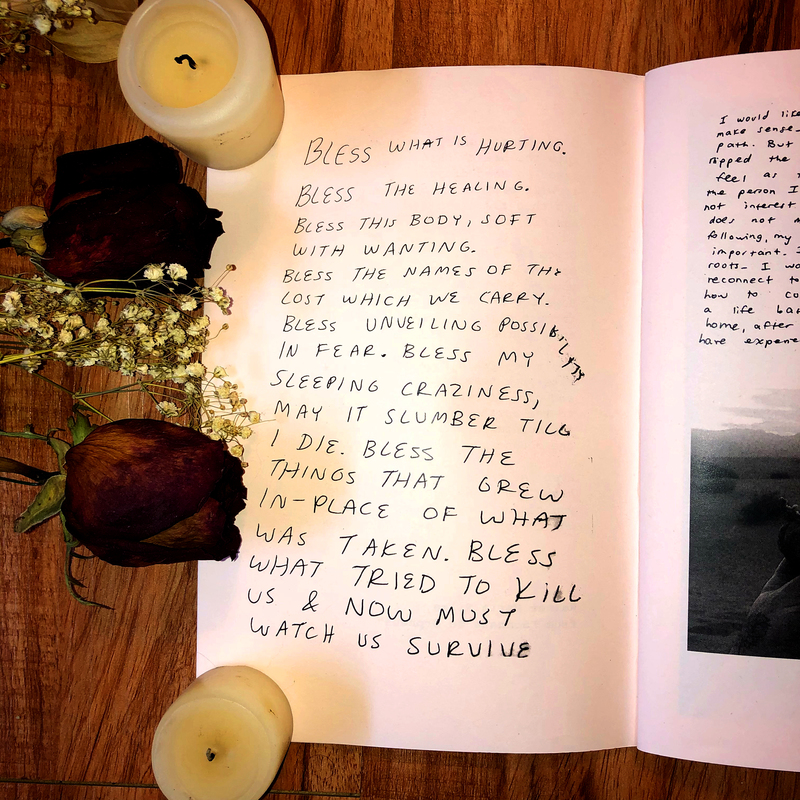 In my experience reading this zine, it’s best read all the way through with no pauses because from beginning to end, it takes you on a complete healing journey, a cleanse of all your toxins. Throughout it, it encouraged me to feel, led me on a journey to heal and forgive myself and the people in my life, and most of all, changed my rigid perspective, my locked in place jaw, my circling negative thought cycles that tell me the other person is doing this out of malicious intent to hurt me, or that my unbearable loneliness will never end. I appreciate that Mathis acknowledged and expressed these dark, deep rooted feelings, and paired them with empowering journal entries that feel like letters of guidance written directly to me. “We all experience these difficult emotions. I often feel alone and ashamed in them, but they’re normal. I believe through speaking about them, and not getting stuck in isolation, we can grow and heal collectively,” said Mathis. The direct quotes of Lora Mathis were taken from our Mental Health Zine Library submission form. To submit your mental health zine, email us a PDF of it to strangeisbeauty@gmail.com.